Marine Layer just rolled into sunny So Cal, and for once nobody is complaining about the weather. Abbot Kinney's newest boutique is stocked with premium T-shirts and apparel, 100 percent made in California. From knitting to dye, every step of the process is done is San Francisco or Los Angeles. The only non-100-percent-California skews are the recently introduced sweaters in the Peru Collection, which are made with a Peruvian spun fiber from a family-run knitter in Lima. One of the best parts about buying local, whether it is a piece of art or a piece of fruit, is getting to know the people behind it and the labor of love that went into it, and Marine Layer's journey from San Francisco to Venice is an interesting story to know. Before "bringing the soft" to comfort seekers all over the world, owner Mike Natenshon started out by selfishly designing his own perfect T-shirt. It had to feel like it was broken in over many years, and it had to have the right fit. As a guy who teetered between sizes, he needed to solve for this as well. The result was a slouchy tee made of pima cotton and silky soft MicroModal, and then three years ago, with the help of his partner and long-time friend Adam Lynch, his apparel company, Marine Layer. 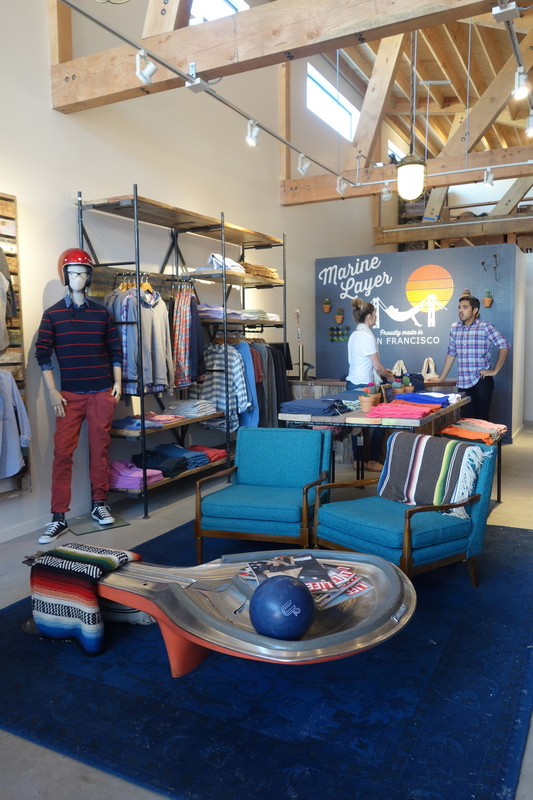 Abbot Kinney's is the fourth store they've opened, with Portland and Seattle up next, and it's stocked with the quintessential tees, available in between sizes marge (medium/large) and larger (large/extra large), as well as hoodies, polos, wovens and outerwear for men and women. All basic tees are $35. Hoodies are in the $75 range and wovens are about $100. You can always try before you buy and have a free fabric swatch mailed to you. Though the 13-person company (excluding store employees) is quickly expanding, it remains committed to its mission of high-quality garments, made locally. Natenshon and Lynch took the new store opening as an opportunity to cruise the California coast from San Francisco to Venice in their branded VW bus. Fortunately, the bus made it all the way here without breaking down ... and then it was towed for parking. Ah, welcome to L.A.
You can read more about their road trip adventures and the constant pursuit of softness here on the Foggy Blog.